Zeitschrift fur Philosophie, Wissenschaft, Occultismus und Spiritualismus. West Point, NE. Language: German. Editor: Max Gentzke. 1/1, 1897-1903(?). Vol. 3, no. 25 was May 2, 1900. $1.00 a year ($1.50 in Germany), 2 pp., 4 sides. The editor of the journal may have been the same as or related to O.M. Gentzke, the editor (1885-1903) of the German-language Volksblatt in West Point. 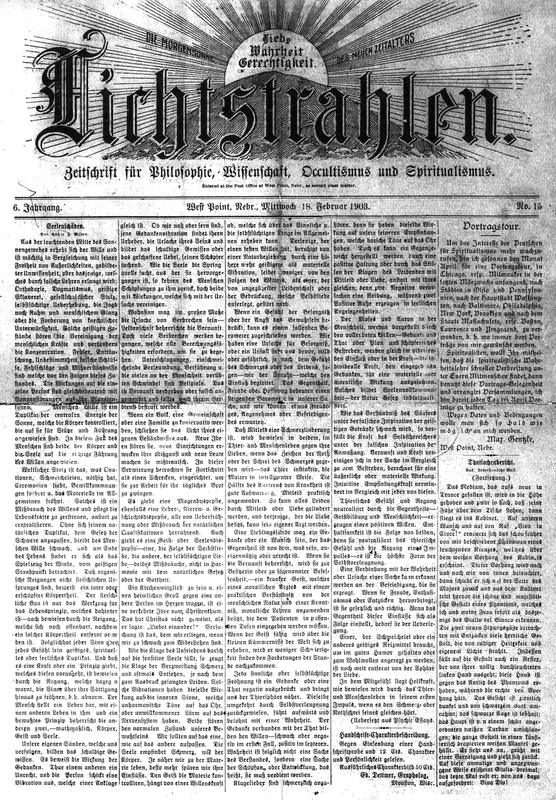 The journal had some original contributions of the likes of "Purpose of Earth Life," "I Die and Yet Live," etc., but is most notable for its notices and advertisements, some in English but mostly in German. These reveal the German-speaking spiritualist world of the period, mainly in Chicago, but also in New York, St. Louis, Baltimore and other places. "Address Change: Mrs. Josepha Finger, Clairvoyant, Card- and Test-Medium, Chicago," "Mrs. Elise Stumpf, Magnetic Treatment, Chicago," "Otto U. Bener, German Astrologer and Magnetist, Chicago," "P. Ilgen, Dr. Ph.D. M., Graduate of E.D. Babbitt's 'College of Fine Forces,' St. Louis," etc., and notices for various Spiritualistenvereins in Chicago, including for the unknown "Church of the Mystic Three." In 1903, the journal carried a "Suitable Offer," by "an educated young gentleman (Magnetist and Naturalist)" in Baltimore who sought a "young lady of means to start a healing institution. The journal itself carried regular advertisements for a line of spiritualist pins and badges and offered (in English) a mail course in astrology ("Be Your Own Astrologer," $1.00). Noted in the Banner of Light, 1899, which labels it the only German-language spiritualist journal in the United States, and in "List of Advance Thought Publications," The New Cycle, March 1900, 159-60. The advertisement in the Religio-Philosophical Journal 35/52 (December 28, 1899): 6, shows the transformation then underway from spiritualism pure and simple to occultism by advertising it as "Die enizige deutsche Zeitschrift fuer Spiritualismus und Okkultismus in den Ver. Staaten." Nebraska State Historical Society microfilm (1900-1903).